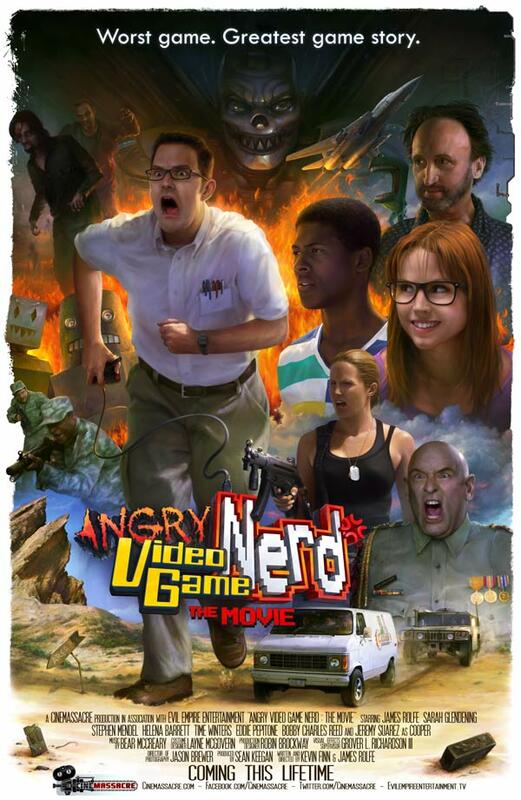 I've always been a huge fan of the Angry Video Game Nerd; and when creator/star James Rolfe announced the potential for the AVGN feature film back in 2010, this was certainly something I was insanely keen to see, though my excitement only dwindled as it began fading into a distant memory considering it's difficulty to construct. Upon it's eventual release in 2014, following a lengthy production schedule built purely off of crowdfunding, extremely mixed reviews turned my attention away from it even further; but now, I've finally got round to checking out, and I can pretty much say these mixed reviews are spot on, and even somewhat generous at times. The film features Rolfe as everyone's favourite Angry Nerd, with the continuing pressure from his fans to review Atari 2600's E.T. and it's burial rumour haunting him more and more as each day passes. Succumbing to said pressure in the end, he embarks on a journey with fan Cooper (Jeremy Suarez) and game developer Mandi (Sarah Glendening) to locate the burial site and prove it's all just a silly urban legend, but soon finds himself tangled up in a government conspiracy involving actual extra terrestrials - with nothing but chaos shortly ensuing. The Nerd actively dodging the opportunity to review E.T. for the sake of the film says a lot about the passion involved in a story over one of the worst games to to date - but sadly, the passion translates to what is generally a film stretched to an awkward length due to an underwritten narrative. The story on paper sounds pretty cool, even if the trailers made it out to be generic and dumb, but the central issue lies with the fact that this simply does not feel like the Nerd we know and love in many of his classic episodes. References to his best lines aside, the Nerd lacks the anger and wit we all wish to see, as if the film wanted to tone things down to appeal to a somewhat wider crowd. As for the supporting characters...well, they ain't much better. As you now know, Jeremy Suarez co-stars as the Nerd's friend Cooper, an equally passionate albeit less angry gamer, with Sarah Glendening as Mandi, a gaming executive responsible for the development of Eee Tee 2, an intentionally bad sequel created due to the increase in sales for bad games - something the AVGN finds himself responsible for. These characters often themselves as annoying pests in the background than genuinely funny supporting roles, and there never seems to be a solid purpose for their existence apart from the Nerd not being enough to carry a feature length film on his own. The same can be said for the villain Sergeant MacButter who, despite a reasonably funny performance by Stephen Mendel, feels cliché and forced in from the start. This film's budget is just over $300K - so you're not gonna expect the special effects to be on par with Hollywood's greatest hits, but I always think that one should work with such limited resources instead of injecting them into a somewhat overambitious narrative. Whilst AVGN: The Movie shines with some moments of interesting set design, cheesy but old school computer effects, and some humourous animatronics, it also falls flat with how blatantly fake some of these effects look which can ruin some otherwise enjoyable set pieces. What's especially pants is the use of miniatures, which is something that has to be nailed in terms of scale, and whenever you see a miniature used in this film to convey an action sequence, you know what it is from the start - the end results are not impressive, making some scenes randomly (and awkwardly) shift from live action chaos to blatant toys on a model landscape. Again, the central issue with this film is it's lack of humour, particularly from the Nerd himself. Rolfe is a fairly mediocre actor, trying to play the Nerd as a character with a deeper personality and some cheesy backstory, which sounds okay in theory, but just doesn't work when we've always just known him as a superbly angry man who reviews crap games. Whilst it does have some moments of hilarity and is somewhat likeable, AVGN: The Movie mostly falls flat due to a clumsy story which doesn't suit the character or the limited effects budget, and an insanely bloated run time that can often make watching it a dull, tedious challenge. Stick to the classic episodes if you want my advice. The Nerd also finally reviews E.T. when the movie concludes as I'm sure you know, and to be honest whilst many were understandably disappointed at his lack of raging and an annoying audience, I find it to be an interesting outlook on what many consider to be the worst game of all time; a review that's more than just the same criticisms recycled again and again. Perhaps it's one of the films most enjoyable moments.